Wheat is a member of the grass family. Various classes of wheat are used for different purposes. Common bread wheat (Triticum aestivum) and durum wheat (Triticum durum) are of importance. Classification into spring or winter wheat is common and traditionally refers to the season during which the crop is grown. Common bread wheat is hexaploid which means that it has six chromosome sets whereas durum wheat has four and therefore is tetraploid. Wheat is believed to have originated in the Middle East. Some of the earliest remains of the crop have been found in Turkey, in Iran, in Mesopotamia and Egypt (7,000-5,000 B.C.). From there wheat spread all over the world. Wheat production is widespread globally. In 2007 China was leading (109,298,296 MT) before India and the USA. Wheat is well adapted to harsh environments and is mostly grown on wind swept areas that are too dry and too cold for the more tropically inclined rice and corn. Wheat is mainly used as a human food. Unlike any other plant derived food, wheat contains gluten protein, which enables a leavened dough to rise by forming minute gas cells that hold carbon dioxide during fermentation. This process produces light textured bread. There are different types of common bread wheat flour which are used for baking. Furthermore wheat is used for the production of starch and wheat germ oil, the production of alcohol including beer. 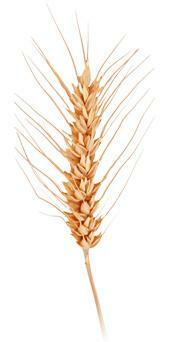 Durum wheat is mainly used for the production of pasta, bulgur and couscous. Furthermore low-grade grain is often used by industry to make adhesives or paper additives.